I must admit I covet this little gem more than a bit. Like a character from Beauty and the Beast, this tiny watch has character for days. And it actually tells time! One foot is the winding mechanism. How cute is that?! 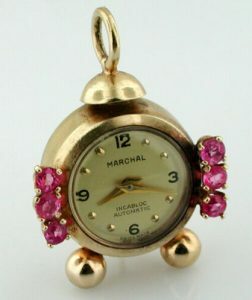 This lovely Marchal Incabloc Automatic Swiss Made watch is 14k gold with six rubies around its face. Don’t you think it’s about time to treat yourself?